Plant and Urchin, set of FIVE(! ), Petit Beast, $35.00. One of the best ways to add interest to your interiors is with plants, flowers, and other various foliages. (That is a word now.) Many of us struggle, though, with the most important part of plant-having: keeping the suckers alive. I myself have just recently reached the point where I can reliably keep a plant alive for more than a couple of weeks. The items I am going to talk about today require no such skill. They are easy, beautiful, last forever, and most importantly, are practically free. I love to see air plants in glass vessels because you get to see the whole thing that way. Roots are pretty too, y'all. I stocked up on these CB2 bud vases and a bunch of air plants, and I now I have a cute little air plant garden on my kitchen windowsill. Plants: Air Plant Supply Co., prices vary. Vases: CB2, $4.95. Closely related to the air plant (which is also called Tillandsia) is the big huge giant air plant, which is called Tillandsia Xerographica. Go on, say it. Now you're smart. They are so big and sculptural that you can literally set them on any surface and they will look awesome. I like mine in a shallow bowl, like the one below. Or I would do a group of three on a tray with a candle or something like that. Tillandsia Xerographica, The Fallen Tree, $12.99. 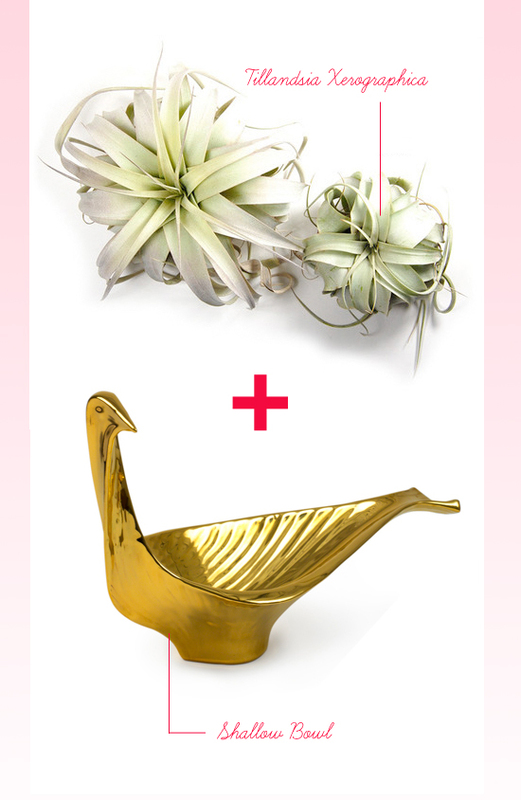 Bird bowl, Jonathan Adler, $188. I am just going to be honest with you, this next one is my favorite. Philodendron leaves cost about one dollar at the florist, and they last forever. I mean months, as long as you keep water in the vase. Hell, probably any old liquid would do. Next time I'm going to try Diet Coke. All you need is one, and a vase or bottle with a narrow neck. Yay! Bottle: You can find them on eBay. Search "demijohn" or "carboy." Corona 26" bypass loppers, Amazon, $41.79. The branch thing will also last forever, especially if you take a hammer and smash up the end before placing it in water. Sometimes the branch starts growing roots, which means you just made a new tree, you nurterer of the earth! BAM. Foolproof foliage. I rest my case.